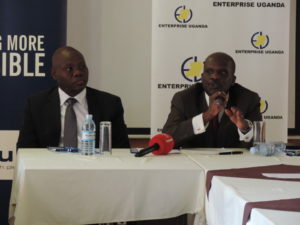 dfcu and Enterprise Uganda officials address the press. 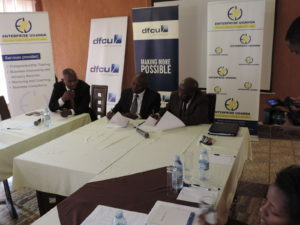 dfcu Bank in partnership with Enterprise Uganda has today announced that it will hold 12 business clinics for its Small and Medium Enterprise customers. The announcement was made during a press briefing which also doubled as the first training session at Mackinnon Suites. The clinics will be held over the course of the next six months and will centre on growing the skillsets of the beneficiaries. Dfcu and Enterprise Uganda staff at the press conference. They will also focus on the five functional areas of business marketing, finance, human resource, strategic planning and operations.The announcement comes a week after dfcu Bank was unveiled as the main sponsor of the 2017 Top mid-sized Companies’ Survey. Speaking at the press briefing, the dfcu Bank managing director, Mr Juma Kisaame, said the Business Clinics were part of the Bank’s strategy to empower the SME business community. “Using the M-S-F Model, Enterprise Uganda will train our SME clients. These training sessions will cater to 35-40 people per session and will cover various aspects related to operating a successful business operation,” Kisaame said. He said all participants in the clinics would be required to create action plans- which would be used during the advisory sessions scheduled to take place a month after the completion of the clinics. 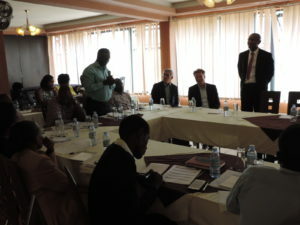 An Enterprise Uganda official (right) addresses journalists.